Kim’s note: In 2019, 75% of Nebraska countries were impacted by floods. Check the Nebraska Game and Parks Commission website to be sure the park you’d like to visit is unaffected. 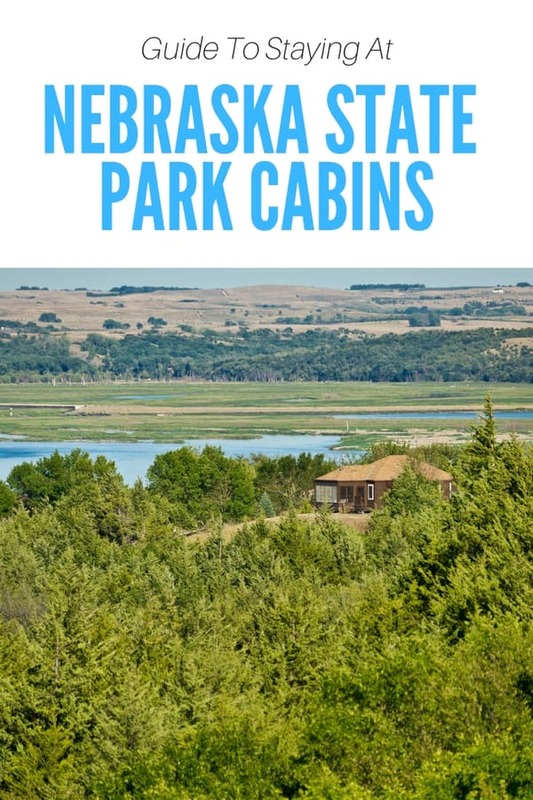 About the cabins: Chadron State Park is Nebraska’s oldest state park. We stayed at one of the two-bedroom rustic cabins during a trip through western Nebraska and South Dakota. It was bare minimum and dated, but a pretty inexpensive lodging option. There are 22 such cabins available seasonally. We stayed at this two-bedroom cabin at Chadron State Park. 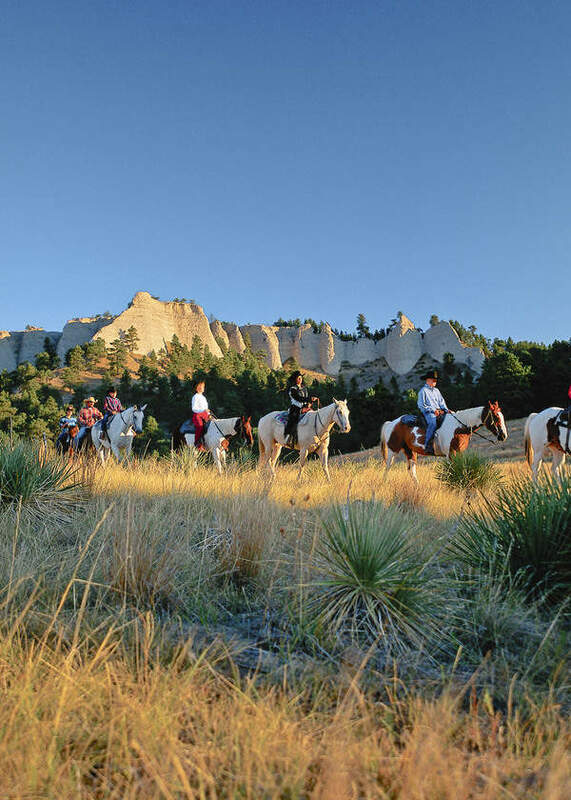 Things to do at Chadron State Park: The park offers horseback trail rides, craft center and evening programs. We spent some time at Chadron State Park with the kids, and visited the pool, hiked, and did the paddle boats. The park lies in the Nebraska National Forest with bike and hike trails through the ponderosa pines. Elevation reaches 5,000 feet in the park. About the cabins: Cabins at Mahoney State Park are notoriously hard to reserve for the summer, especially for weekend stays, so the sooner you pick a date, the better. Reservations may be made up to a year in advance, which is what you’ll need to do for the summer. Winter reservations are much easier to make and, also, cost less. Mahoney State Park has some of the newest cabins in the park system, and they usually are reserved first. I’ve stated at treetop cabins and would recommend them. They’re older, certainly, but pretty comfortable with a “treetop” living room. All cabins at Mahoney State Park are fully furnished, include a fireplace, satellite TV, and WiFi. There are 57 cabins, with more under construction. There are 49 two-bedroom cabins, three four-bedroom cabins, and five six-bedroom cabins. The park also has Peter Kiewit Lodge, which has 40 guest rooms, some with sleeping lofts and electric fireplaces. Things to do at Mahoney State Park: Summer is peak season at Mahoney. The park has a Family Aquatic Center with two waterslides, zero-depth wave pool and a water playground, plus a traditional pool. There is also a zip line course, horseback trail rides, putt putt golf, fishing, paddle boats, craft center, disc golf, and a live theater. Hiking isn’t the best here, but there are some trails. Don’t skip the conservatory and observation tower. Mahoney State Park has a lot of activities for families. There’s also a great indoor play area with a climbing walls. In the winter, there is ice skating, sledding, and ice fishing. Here are more things to do at Mahoney State Park in the winter. 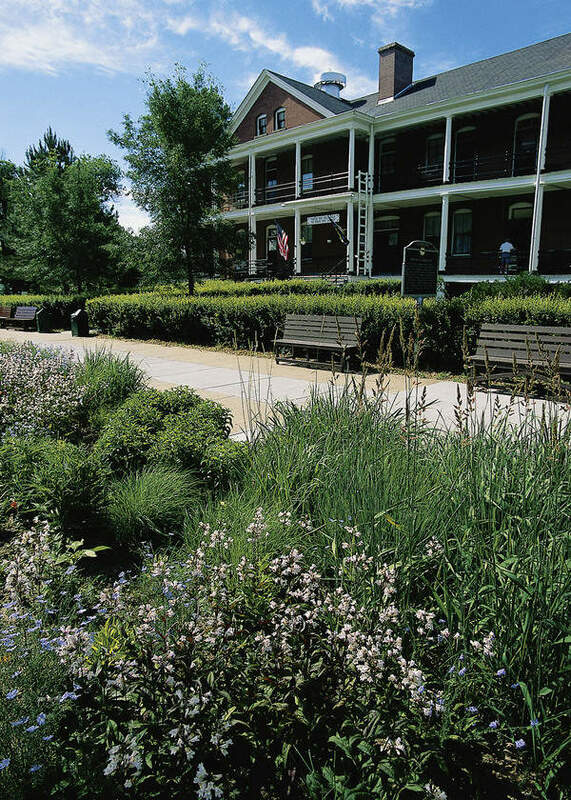 About the cabins: Rather than having individual cabins, this park makes use of the historic fort’s 1909 enlisted men’s barracks for accommodations. This is quite possibly the best park in Nebraska for large family reunions. Accommodations sleep between 2 to 60 people, with 35 different group lodging options to choose from. All options have kitchens, baths and bedrooms. Larger cabins have living rooms. 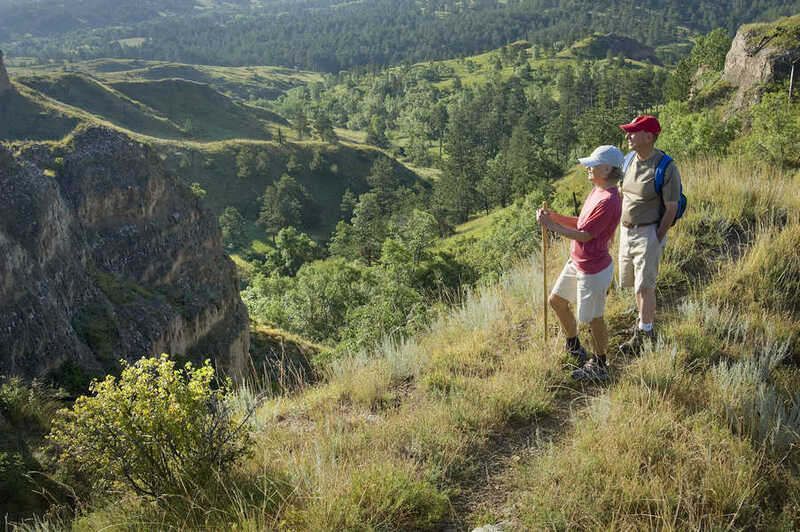 Things to do at Fort Robinson State Park: This park is spread out over 22,000 acres with an abundance of things to do in the summer. Much of what there is to do and see is connected to the outpost’s history when it was in operation during the Indian Wars until after World War II. The park has an enclosed swimming pool; museums; horseback trail rides and pony rides; rides by jeep, stagecoach and hayrack; bike, kayak and tube rentals; hiking trails; and fishing. For food experiences, the park has buffalo stew and steak cookouts and hayrack breakfasts. When we went to Fort Robinson with young kids, the highlight was definitely the off-road jeep rides (though the ponies were a close second). 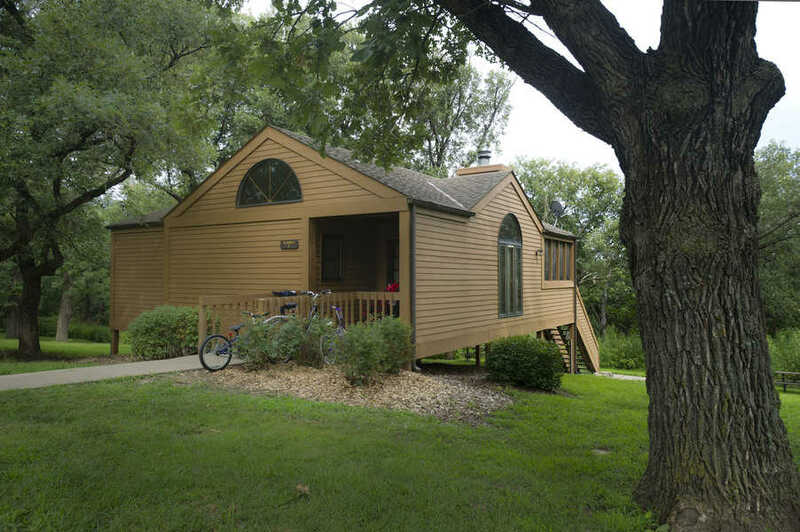 About the cabins: Lewis & Clark has 10 newish modern lakeside cabins next to Nebraska’s second largest reservoir. All are two-bedroom cabins that sleep up to eight, plus they’re air conditioned. Each cabin has a porch with a picnic table, grill and a view of the lake. Things to do at Lewis & Clark SRA: This park has an unsupervised swimming beach. There are a total of five recreation areas on the lake that feature hiking trails, mountain biking, and lake access. This lake, as you can imagine, is popular with boaters. About the cabins: Medicine Creek has four lakeside, two-bedroom cabins that are available to reserve from April to December. They’re fully furnished with an indoor bathroom and include a deck. Things to do at Medicine Creek Reservoir SRA: Medicine Creek is among southwest reservoirs that offer quite a bit of water-based activities. This particular state recreation area has an unsupervised beach and boat ramp. Fish for walleye, white bass, channel catfish, flathead catfish, wiper and crappie there. The other reservoirs nearby are Swanson Reservoir SRA, Enders Reservoir SRA, and Red Willow Reservoir SRA. 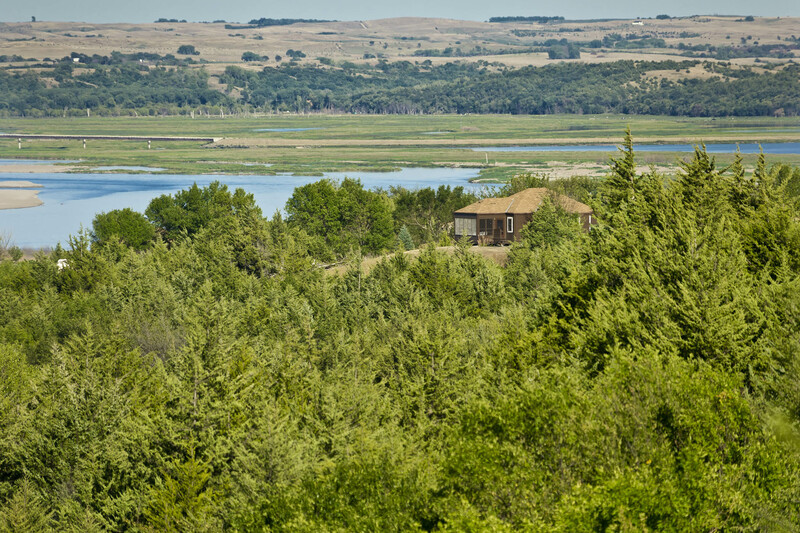 About the cabins: Niobrara State Park has 20 modern cabins, with a mix of two-bedroom and three-bedroom options. 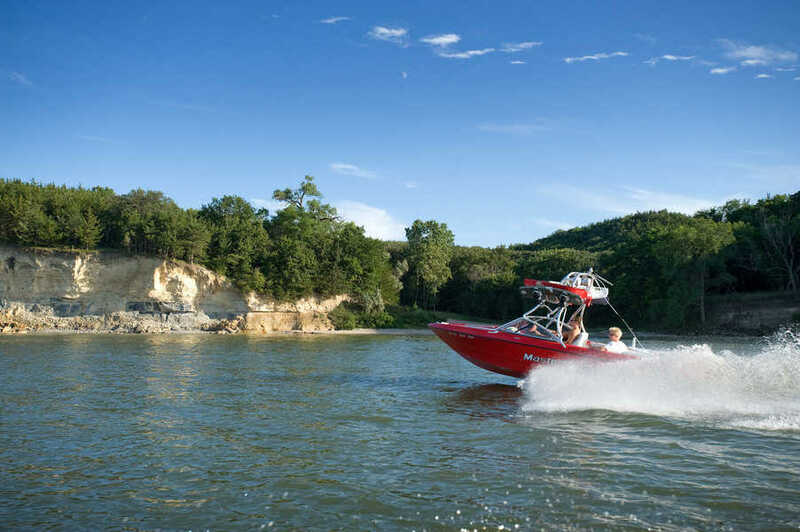 Things to do at Niobrara State Park: The park sits on the confluence of the Niobrara and Missouri rivers, so you can imagine access to the rivers are a draw for boaters. There are also horseback trail rides, buffalo cookouts, hiking trails and a pool (open mid-June to mid-August). There are two ponds at Niobrara State Park that are stocked with largemouth bass, bluegill and channel catfish. Go to pond 2 for rainbow trout fish in the fall and early spring. The buffalo cookouts are popular and held on Saturdays throughout the summer. The cookouts include entertainment, which may be cowboy poets or storytellers. Reservations are required, and you’ll need to make them at the park admin office. 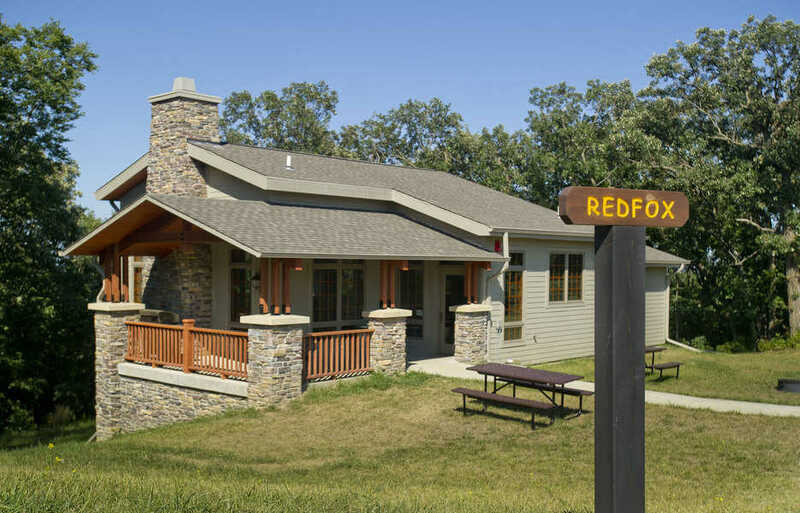 About the cabins: Platte River State Park has quite possibly the widest range of accommodations, from absolute bare minimum to the ultimate in glamping. There are 20 modern cabins, including one four-bedroom cabin. Four of those modern cabins have a fireplace. In 2018, the park opened its glamping tents, ultramodern two-person digs that are pretty swanky. They also book very far in advance. The camper cabin at Platte River State Park offers beds with bedding, A/C, and a refrigerator like other modern cabins, but it lacks one biggie: Water. You’ll have to walk if you want to take a shower, use the restroom or wash your hands. The park also has camper cabins. I’ve stayed at one of these and they’re bare bones, but super affordable. There is no running water and you must use the restrooms/shower facilities with other cabins. Most cabins have air conditioning. Most. There are also teepees at this park. Things to do at Platte River State Park: Platte River State Park has some great hiking trails, including an easy, kid-friendly trail that passes a little waterfall. The park recently opened a large sprayground that replaces its pool. There are horseback trail rides, paddle boats, naturalist programs, Crawdad Creek, an observation tower and fishing opportunities. This is one of the few parks to have a shooting range for a variety of disciplines, including sling shot, tomahawk throw, rifle, pellet gun, and shot gun. We’ve been there when they’ve offered educational programs, where my kids learned some archery basics. 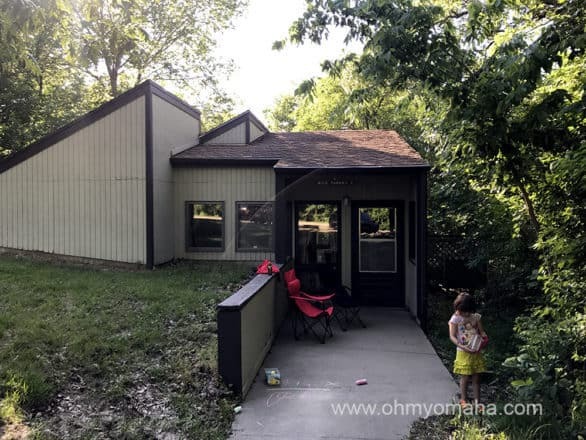 About the cabins: Ponca State Park opened 10 gorgeous two-bedroom cabins in 2017, which adds to their 15 four-bedroom mini lodges, two two-bedroom “green” cabins, and rustic log cabins (two-bedroom and one-bedroom options). The new cabins are often all reserved early so plan accordingly. Things to do at Ponca State Park: I haven’t been to Ponca in years, but it’s a picturesque park situated on the Missouri River, and one of the most popular state park in Nebraska. There is a new aquatic center, as well as hiking and mountain bike trails, kayak programs, and horseback trail rides (Memorial Day to Labor Day). The park also has a nine-hole golf course and a shooting range. Ponca State Park features one of the state’s most comprehensive outdoor and environmental education programs, with programs held daily Memorial Day through Labor Day and on weekends during the spring, fall and winter. Spring is a good time to visit for bird watching. In the fall, they have a popular haunted hayrack ride. 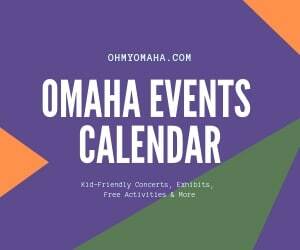 There are winter activities, as well, including snowman building contests, sledding, ice fishing, and special events like Christmas in the Woods and Winterfest. About the cabins: Two Rivers doesn’t actually have cabins. Instead, they call their “cabins” caboose cabins. They have a lot of amenities that you’d find in traditional cabins – air conditioning being one biggie. Each has a kitchen and restroom and sleep up to six people. It’s one of the more unique lodging options in Nebraska. Things to do at Two Rivers State Park: Two Rivers State Park has sandpit lakes that are popular for catch-and-release fishing. Catfish are stocked in Lakes 3 and 4; Lakes 1 and 2 are stocked annually with catchable channel catfish. Find largemouth bass at Lakes 1-4. Fee rainbow trout fishing is available at Lake 5, as is smallmouth bass. There is unsupervised swim beach, which we visited once. It’s rather small, but the kids liked it. This is not a park for hikers. About the cabins: Cabins are limited here – just two modern, two-bedroom. The cabins have a kitchen (with ranges, refrigerators, tableware, sink), double beds, linens, blankets, shower and toilet. The kitchenettes are furnished. The cabins are seasonal and are typically available from Memorial Day Weekend through mid-November. Things to do at Victoria Springs SRA: Victoria Springs is one of the state’s oldest parks, and its waters were once renowned for its “healing” qualities back in the heyday of spas. Now it’s just a picturesque getaway in the Sandhills. Fishing is a draw, and the 5-acre pond is stocked with bass, bluegill and catfish. Boating is permitted and paddleboat are available to rent. 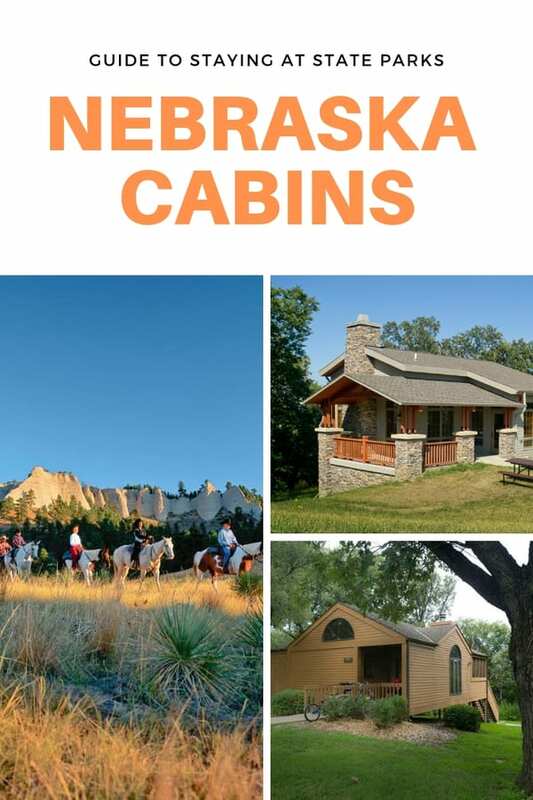 There are two ways to reserve a cabin at a Nebraska State Park. You can reserve them online at OutdoorNebraska.org, which is my preferred method. 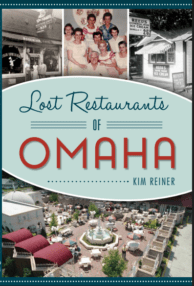 You can also call 402-471-1414 (they have pretty traditional business hours, Mondays through Fridays from 9 a.m. to 6 p.m.). There is a two-night minimum for reservations are required if you’re staying at peak season, and weekends. Otherwise, one-night stays are allowed during non-peak season from Sundays to Thursdays. Want to stay in a yurt? Nebraska doesn’t have yurts, yet. I stayed at the closest yurt to Nebraska one summer – you can find two yurts in Clear Lake, Iowa. So neat – I particularly liked the caboose cabins. How cool. I’ve never spent much time in Nebraska at all but this really makes me want to get there. Lovely post. 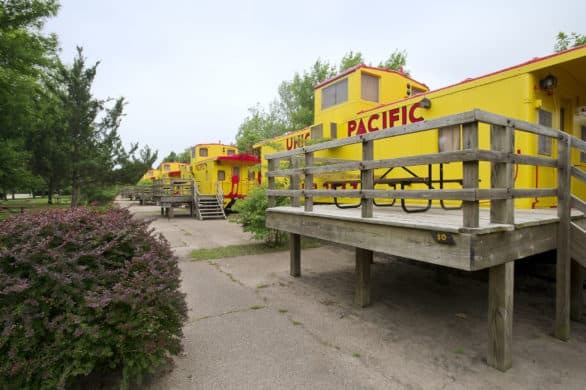 I haven’t stayed in a caboose yet, but I have a reservation to go this summer. I’m hoping the park recovers from the floods before then!